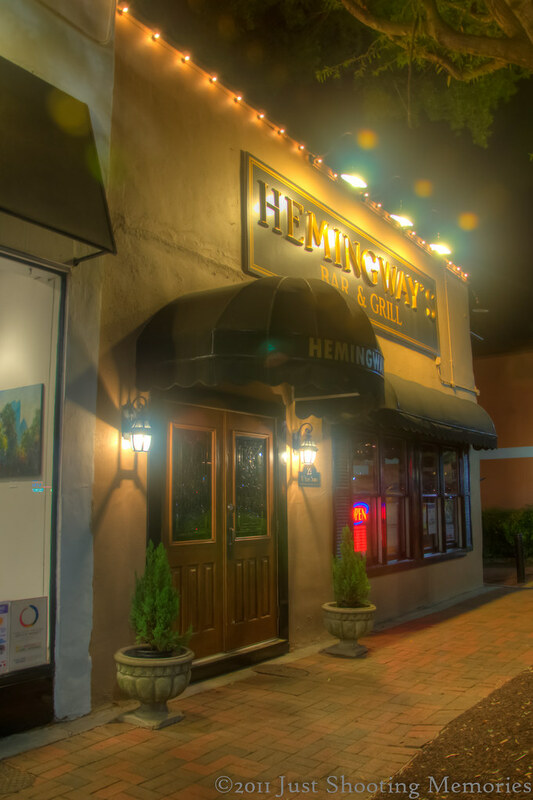 Hemingway's | Just Shooting Memories! The other night walking around Marietta, I ran across this little bar. It appeared warm and inviting, but unfortunately it was not the right place to take the kids. I was able to take them to the art studio which was next door. Now they want to go back every Saturday to paint. This made me think of high school and college. I was horrible at English and Literature. About the only thing I really liked was poetry. However, I was able to work my way through most of Earnest Hemingway’s work. I must have done something right, I passed. Where is this? There must be thousands of Hemingway-themed bars and taverns around the world. My favorite is in the Ritz hotel in Paris. Be careful when ordering, though. The Hemingway Sidecar is about 300 euros. Downtown Marietta Georgia on the square. I will have to return without the younglings to see how it is. I will watch out for the Sidecar though. Thanks for the warning. I do like the warm feel of this photo. The glow and softness has an inviting effect. For me too Tim. And I could imagine the stop on my trip around downtown Marietta too. Thanks for the comment.